There are some inescapable facts about music. One of those facts is that every song has a story. Sometimes that story is told through the lyrics, an autobiographical window into someone else’s world, or maybe it’s a fictional world created just for you. Sometimes it is in the music, a mystical tapestry of sonic stimulation that takes you to a place that words cannot. Frequently with commercial music the real story is that someone wants to make money, they have a hook a line & a catchy melody that is carefully placed together and given to someone to sing & play. Regardless of how good the story is, or is not, each song still has a story and so it is with the song I am about to share with you. This is a bit of an odd one, writing this post in November that is, you see I recorded this song mostly in June, tinkered with it a bit in July & then had every intention of writing this post at the beginning of August. Then doubts crept in, it’s no good, it’s not representative of what I can do today, I don’t really like it, why would anyone else, you know, that BS that we all get when we create something. So it has sat, until recently & then I just decided, what the heck, share it, maybe a couple of people will listen, maybe one will like it, it doesn’t matter, the point is to not allow those fears to build back up. The main reason I ever share anything on here is to fight those internal fears that tell me I am no good, even though I know that is a lie. So the song, it was originally titled “I Need You”, I changed it to “In a Mess”, which is one of the very few things I changed on it, I’m not sure why I changed the name but the new one seems to fit better. 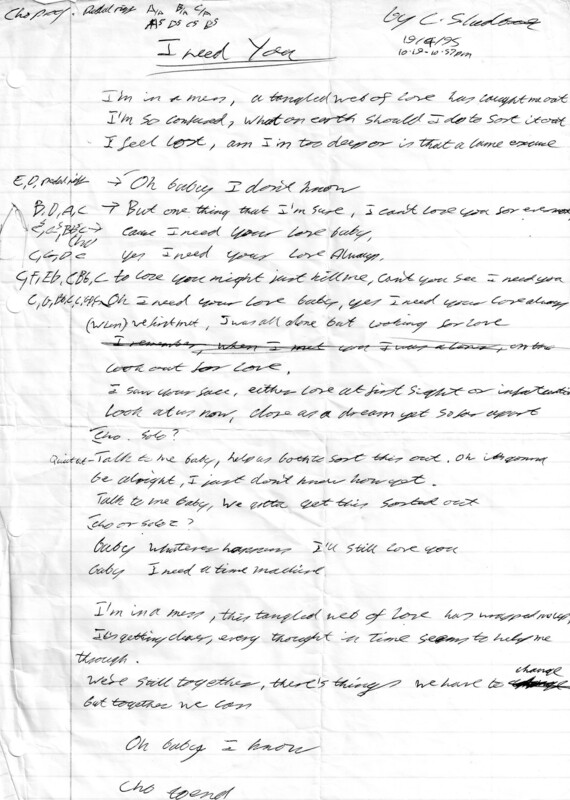 I wrote this song on April 19th 1995 (yes 1995, that’s not a typo), the note on the paper states that it was written in 38 minutes, between 10:19 & 10:57pm. That would place me at 18 years old at the time of writing and a little over a year into my guitar playing journey. The song itself is not, that I recall, autobiographical, it appears to be about someone who is in a relationship that is on the verge of ending, but despite the chaos the person knows that he does not want the relationship to end, because he needs the love of his partner. The real story of the song however is that there was once a young 18 year old kid who wanted nothing more than to be a rock star and every time he tried to write a song it seemed to come out slow & mushy. So this time, equipped with a riff he borrowed from an instructional book & modified somewhat, he was going to write a rock song come what may. The result is pretty much what you hear here. When I decided that this would be the next song I was going to record one of the parameters I set myself was that I was going to leave it as untouched as possible. The point in recording / sharing this was to do something for that 18 year old, who was to afraid of rejection to ever really share his music, that he was never able to do for himself. Lyrically I left it pretty much alone, a slight edit/delete for a couple of lines that didn’t flow at all, but you can see from the original writing that it is all still here. I resisted changing the key to one that better suited my vocal range, the riff is completely intact, I don’t recall how the solo originally went, but I am please with how it ended up, it seems to fit the song well. I honestly feel that if I had access to a DeLorean & could fire it up to 88 & get back to ’95, my 18 year old self would be thrilled with what I have done with it. That in itself is enough to please my 37 year old self. When I am recording I have to remind myself that the best I am realistically going to achieve is a decent demo. I don’t have the know how or equipment – yet 😉 to make it sound like I paid big money to visit the warehouse In Vancouver & hire Butch Vig to produce it. That is more than ok, yet sometimes it is frustrating when I just cannot get it to sound the way it should in my mind (I guess that’s why they make the big bucks). So anyway, for those who care, here is what I did with the tracks, starting with the guitar (of course). For the main riff you will find 4 separate guitar tracks. 2 each with the bridge pickup of the Les Paul & my HSS strat, yes that is a lot of humbucking! The guitar was recorded running my Boss GT-8 direct to Cubase which is the first time I have done it that way, usually I run it into an amp & mic it up. It is much easier to control the frequencies this way but it does lose a certain je ne sais quoi, I was however happy with the results & will use this method again depending on what the track calls for. The Les Paul was run through a Marshall stack patch that I call my Slash patch. The strat was run through a Soldano SLO-100 patch which has a very different, yet still highly overdriven, sound from the Marshall (digital versions are as close as I will get to them unfortunately), so that is how I came up with the 4 tracks. 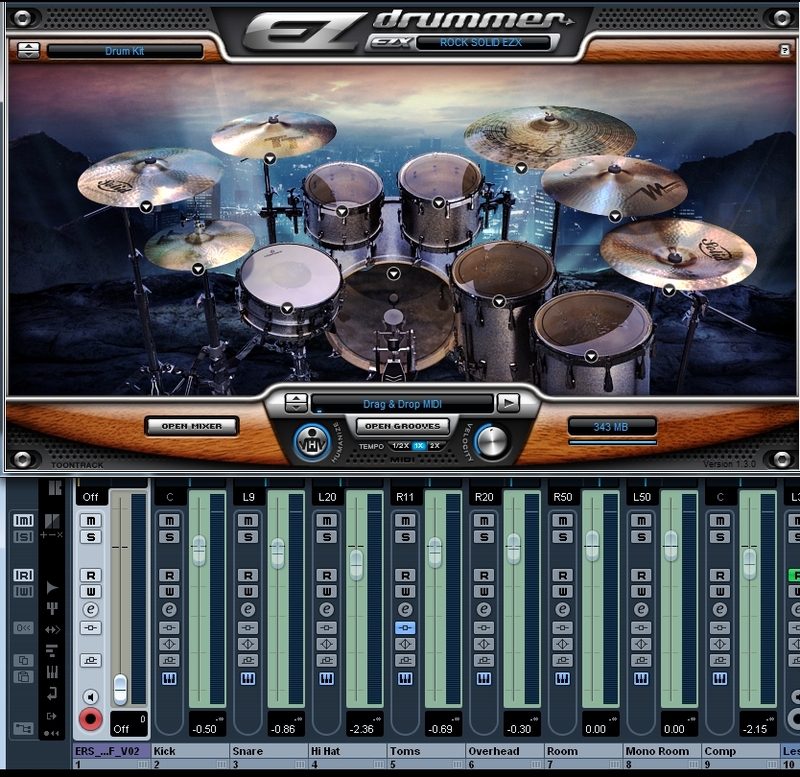 The drums were as usual created using Ezdrummer. The kit was the main kit from the Rock Solid expansion pack, it has some great sounding rock kits in that one. As always seems to be the case, there was not a preprogrammed midi pattern that would fit my needs, either they provide odd patterns or my tastes are more unique that I realize. 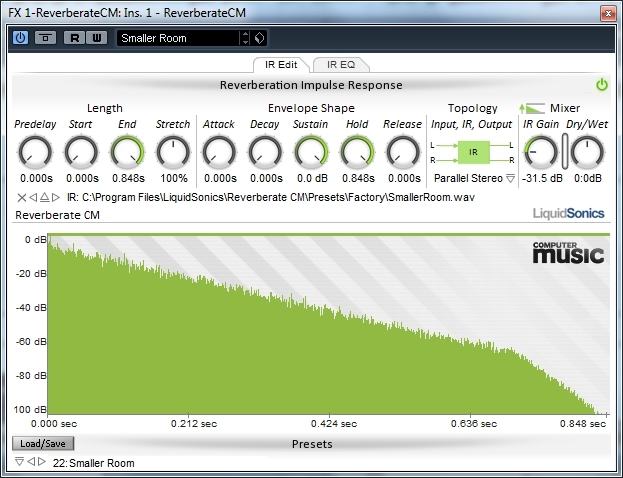 Regardless, for the main riff I took the closest thing I could find & then modified it to meet my needs. I think for the chorus & other parts I found something lose enough & then for the fills I merged & edited a few patterns to create something more unique. 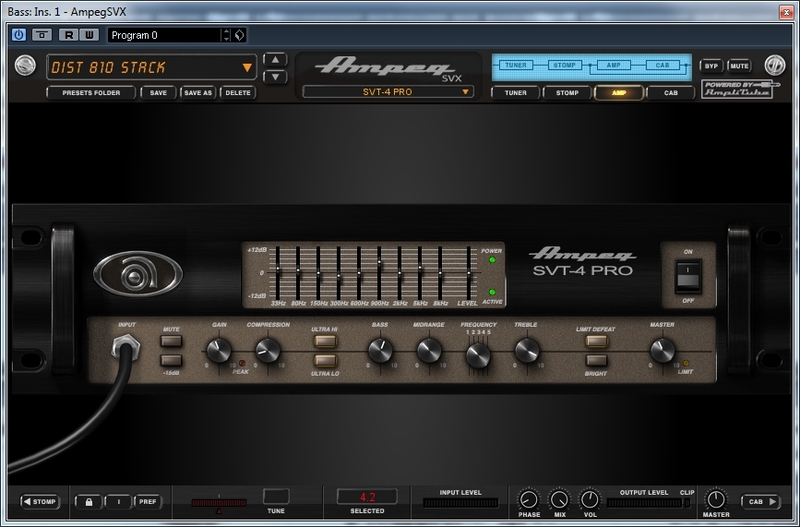 The bass was played through my trusty Ampeg SVT plugin, not I did say player, I might not play bass, but I can play guitar well enough on a bass to get a bass line for a song, lol. However as the bass world is pretty foreign to me I just used a stock pack from the plugin, fortunately al of the provided ones sound & work really well. This particular one, the Dist 810 stack, is based on the SVT-4 Pro amp. The vocals have a little EQ on them, some compression, a limiter for clipping control & a dash of BBE sonic maximizer & a send to some reverb. No auto-tune, ever, however close I get to signing in tune is what you will get, always, not sure why but that is a house rule in my home studio. I threw a little harmony vocal onto the track right at the end. It is not as tight as I originally intended, but I left it loose as it is because I liked the way it sounded like 2 people singing in a band as opposed to an overdub. A new technique that I had to figure out was automating the delay effect, I wanted it only at certain points & so had to learn the automation of a send effect. It was not that difficult fortunately & I like what it added. 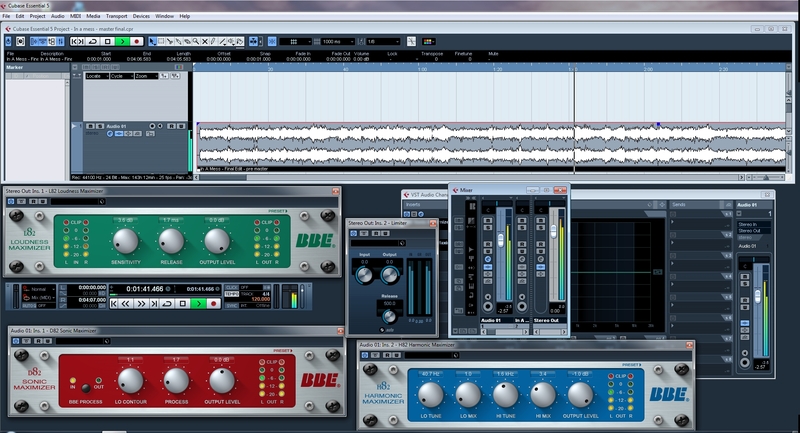 The mix was mostly done in recording, leveling & panning to fit as I go through the process works well for me. Once I had the mix set I exported & then imported into a new track to try and do some mastering. I usually do not bother with this as previously I have had nothing to add at this stage. However thanks to a heavy discount on Musician’s Friend “stupid deal of the day “ I picked up the BBE Sonic Sweet set of plugins. I tried each of them individually & also different combinations but finally settled on using all 3 in sync with each other. They definitely add some sheen to the track & also enable it to come up close to commercial volume levels without just seeing a solid red warning light from all the clipping. Thanks for sharing your song and for sharing about your recording process. You are very talented 🙂 Blessings to you!